FILE - This is a general view of the crowd at the Woodstock Music and Arts Festival, Aug. 14, 1969. 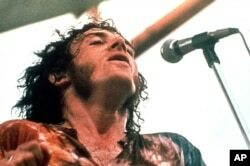 Michael Lang, the co-producer of the 1969 Woodstock festival, announced on Wednesday that the official Woodstock Music and Arts Fair would take place from Aug 16-18 at a motor-racing venue in upstate New York. Last month the Bethel Woods Center for the Arts, the current owners of the field where the 1969 festival took place, announced it would mark the 50th anniversary with a "pan-generational event" on the same dates. "The original festival in '69 was a reaction by the youth of the time to the causes we felt compelled to fight for — civil rights, women's rights, and the antiwar movement, and it gave way to our mission to share peace, love and music," Lang said in a statement. "Today, we're experiencing similar disconnects in our country, and one thing we've learned is that music has the power to bring people together. So, it's time to bring the Woodstock spirit back, get involved and make our voices heard." 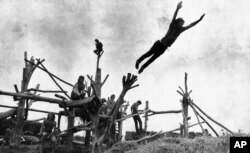 FILE - Rock music fans sit on a tree sculpture as one leaps onto a pile of hay during the Woodstock Music and Art Festival held on a cow pasture at White Lake in Bethel, New York, Aug. 15, 1969. The August 1969 Woodstock festival, billed as "three days of peace and music," is regarded as one of the pivotal moments in music history. Over three sometimes-rainy days, more than 30 acts — including Jimi Hendrix, Janis Joplin, The Who, The Band, and the Grateful Dead — performed around the clock to a 400,000-strong audience, most of whom watched for free and camped onsite in the mud. The festival was documented in the 1970 film "Woodstock," which won an Oscar. Lang did not announce the 2019 performer line-up but said more than 60 musicians would take part on three main stages at Watkins Glenn International, the site of car racing events including NASCAR. “It will be primarily contemporary talent, but the legacy acts will be represented and honored,” said Lang, referring to the surviving musicians, now in their 70s, who continue to perform. FILE - Joe Cocker performs at the Woodstock Festival of Arts and Music in Bethel, New York, August 1969. Although it was known as Woodstock, the 1969 festival actually took place in Bethel, some 70 miles (110 km) south of the village of Woodstock and 90 miles (144 km) north of New York City. Watkins Glen has a larger crowd capacity and is some 150 miles distant from Bethel and about 250 miles north of New York City.